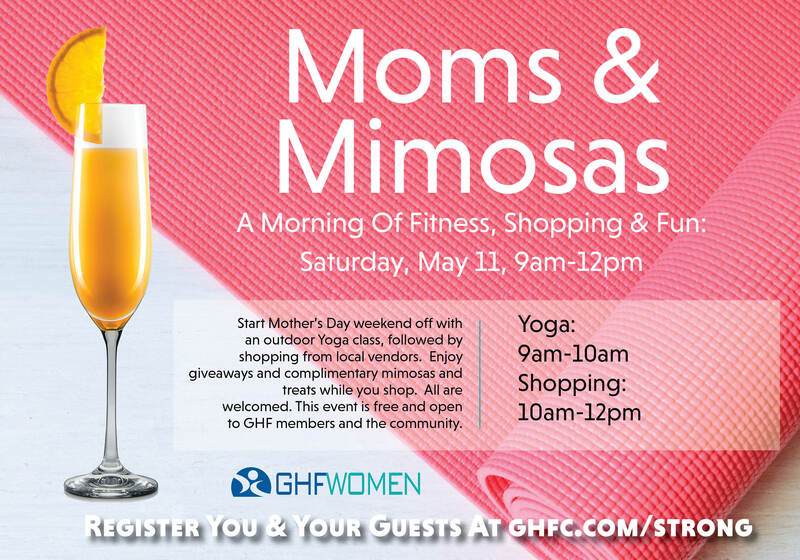 Join GHF Women and other women just like you for a morning of fitness, shopping and fun. Start Mother’s Day weekend off with an outdoor yoga class, followed by shopping from local vendors. Enjoy giveaways and complimentary mimosas and treats while you shop. All are welcomed. This event is free and open to GHF members and the community. 9:00-10:00am Outdoor Yoga: This class utilizes specific postures, breathing techniques and relaxation to develop muscular strength, flexibility and body awareness. 10am-12:00pm Shopping: Enjoy shopping from local vendors and find the perfect gift for mom or yourself while you sip on complimentary mimosas and treats.